Doug Durocher has lived all around the country, growing up in Detroit and Atlanta, and later holding radio jobs in Honolulu and Riverside, California. Doug took an unusually roundabout path to radio. Despite his degree in Journalism, Doug spent his early twenties waiting tables and bartending in fine dining steakhouses, where he met many celebrity customers, one of which (Bruce Willis), convinced Doug to get into the entertainment industry. He has performed standup comedy numerous times, including at the famous Improv in Los Angeles. However, radio, specifically doing morning drive, is his first love. Doug greatly enjoys playing pick-up basketball games, and is also an avid snowboarder. However, he is also a big fan of “doing nothing” at home and, as a result, has an encyclopedic knowledge of pro and college sports. He is also one of those guys who knows every movie line ever and drops them liberally into any conversation. 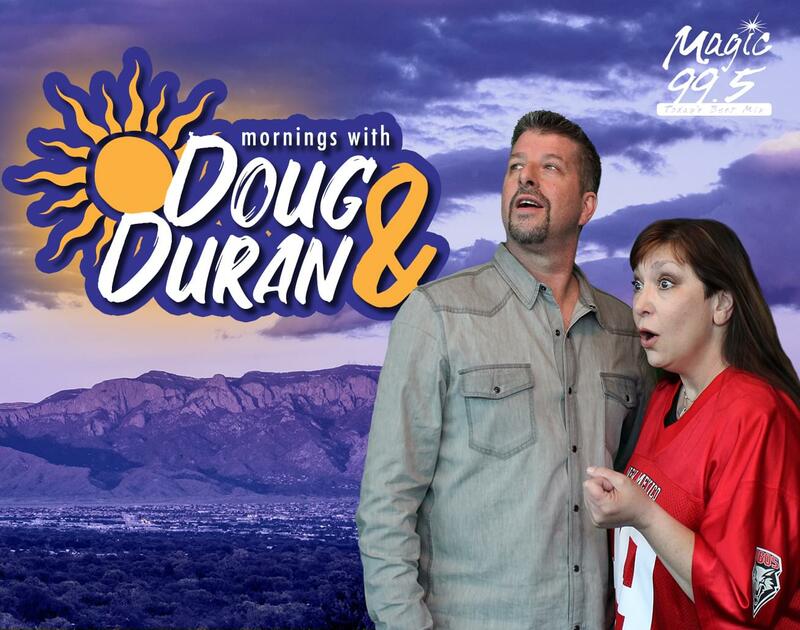 Despite being in a long term relationship, Doug has never married and has no children and lives alone in downtown Albuquerque with his cat, Bodhi, who he runs every show idea past before the next day’s show. Sports, movies, and afternoon naps being his greatest passions. Steph Duran was born and raised in Albuquerque. She started in radio during her last semester of high school at the Albuquerque Academy, through the Senior Project program. From that moment she was found and knew exactly what she wanted to do! After studying at UNM, one of Steph’s very first professional radio jobs was at KOB-FM. She was a morning show producer for the legendary “John and the Bean” and even held down her own airshifts. Starting in the early 1990’s, Steph lived and worked in Phoenix, Arizona. She was the co-host for “Pratt in the Morning” with Valley icon Dave Pratt for 5 years and then anchored “Steph and John” on KZON, and ended up beating her former partner for the #1 Morning Show adults 18- 34, within 15 months. In the Fall of 2000, Steph was offered a challenging and completely different kind of Morning Show and environment. She and her family packed up and became Midwesterners, in St. Louis, Missouri. By the spring of 2014, Steph was doing Mid-days for The New Fresh 102.5. According to PPM, Arbitron, St. Louis, 23% of all radios turned on during the mid-day were tuned to Steph…not a bad accomplishment!